In a half-circle around him are a dozen smiling Peconic Landing residents. When he concludes a number, they all clap softly. He stands, shuffling through his music to pick a new tune. He then sits and lets his fingers dance over the keys, repeating the sequence multiple times during his hour-long visit. Mr. Connolly, of Southold, has visited Peconic Landing every Thursday for the past six years, performing some of his favorite songs for groups of interested residents. At a luncheon a few weeks ago, he was recognized for his continued dedication as Peconic Landing’s 2017 Volunteer of the Year — the first non-member to receive the distinction. His name was added to a plaque listing all those who have received the award since its inception in 2010. 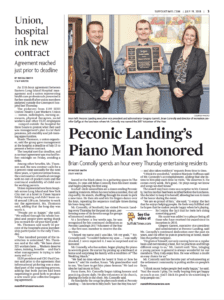 Gregory Garrett, executive vice president and administrator at Peconic Landing, said Mr. Connolly’s continued dedication over the past six years, and the effort he puts in practicing at home, made him the perfect recipient.